There’s been a number of beery birthdays of late. Back of the Ferry is a big fan of @Untappd – a website and smartphone app that enables people to drink socially. It’s sort of Facebook for pissheads, with links to FourSquare and Twitter as well. Whilst I’m not Back of the Ferry’s technology correspondent, I will proffer the view that I don’t know if Four Square has legs – I don’t get it. 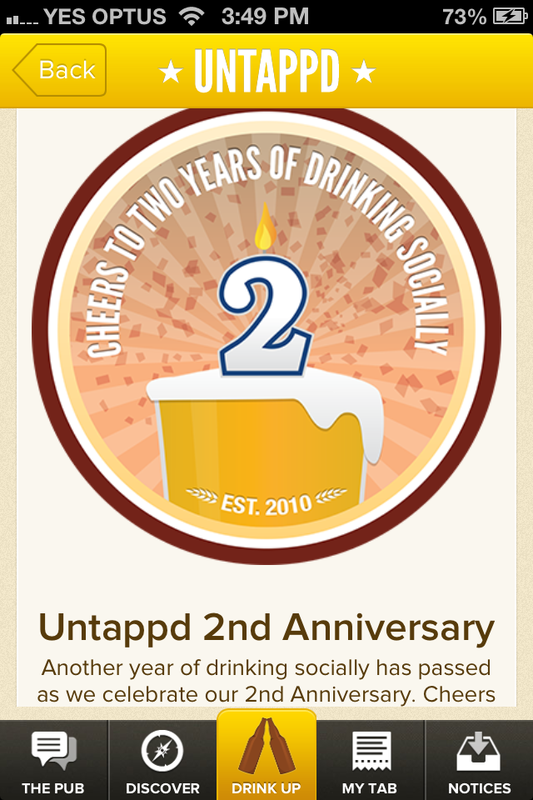 Untappd seems to be going from strength to strength, though and they celebrated their second birthday with a birthday badge. Appropriately, Back of the Ferry obtained their badge on the back of the ferry with a Feral White, which wasn’t an @Untappd unique. There’s a few social beer apps out there – Beer Buddy, Kenny the Beer Dog – but @Untappd looks like it has the front running. Happy Birthday to the @Untappd creators. A BotF obsession is to reach the 1,000 unique beers on our Back of the Ferry @Untappd account. We are getting close. A place that has been particularly helpful in reaching that goal celebrates their 3rd birthday today.Porter’s Balgowlah is located on the corner of Sydney Road and Woodlands Road Balgowlah. 3 years ago they became an independent bottle shop and their ability to turn up weird and wonderful beers is pretty remarkable for a suburban bottlo. Lately they’ve turned up some absolute rippers and the Black Chocolate Stout made by Brooklyn Brewery was one the finest I’ve had for some time. I’m also a fan of their support of Southwark Stout. To celebrate, they put on a beer and wine festival. 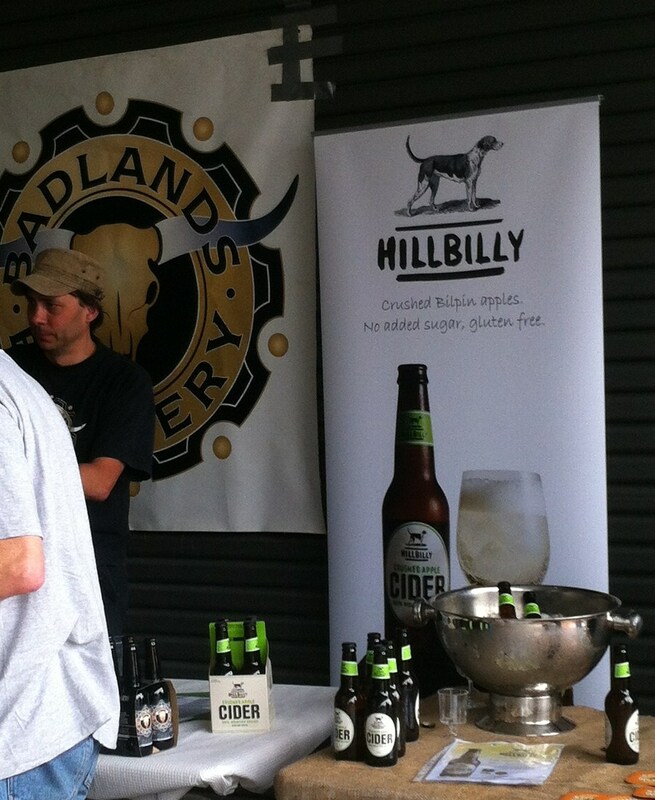 Stone & Wood, Badlands and Hillbilly Cider turned up and Porters offered tastings of some of their new beers including one from Cambodia, that might get a run in a separate post. A very happy birthday and a very good idea. It was also this correspondent’s birthday this week. As previously mentioned, my birthday coincides with Halloween, and it’s always been a muted affair as I try and avoid the faux Halloween celebrations. I did manage to slip over to a favourite BotF venue for one of the few pumpkin beers I’ve seen this year. 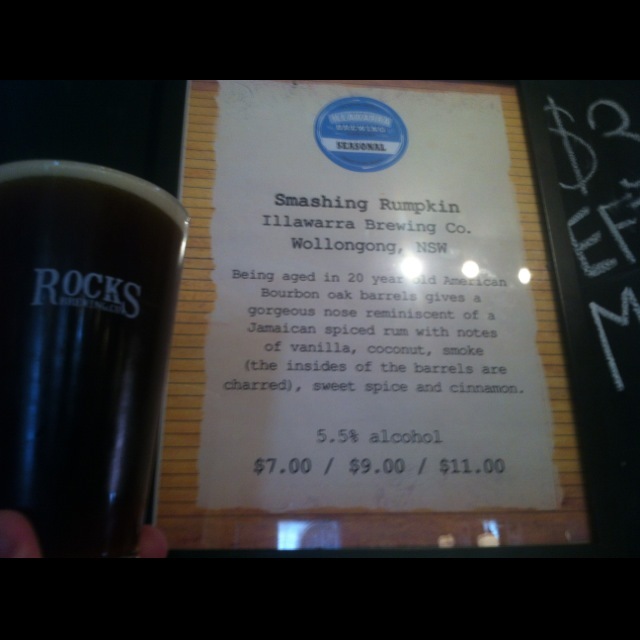 Illawarra Brewing loves making this type of beer and their 2012 variety is a good ‘un. 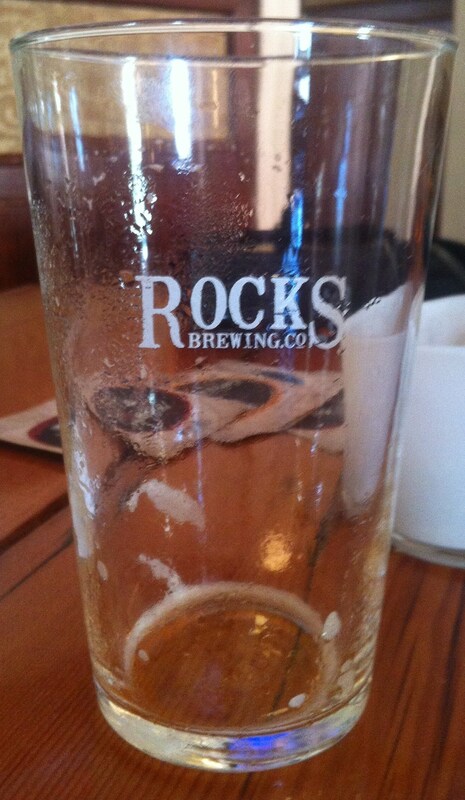 Whilst it proclaims to have pumpkin and yam in the mix, I reckon the dominant story of this beer was the use of spice. This was a warming, rich, spiritous beer whose spiciness comes from the bourbon barrels in which it was aged. Happy Halloween to me. Rather than endure the nightmare of Halloween on our street, I spent the evening at a charity dinner for Accessible Arts. 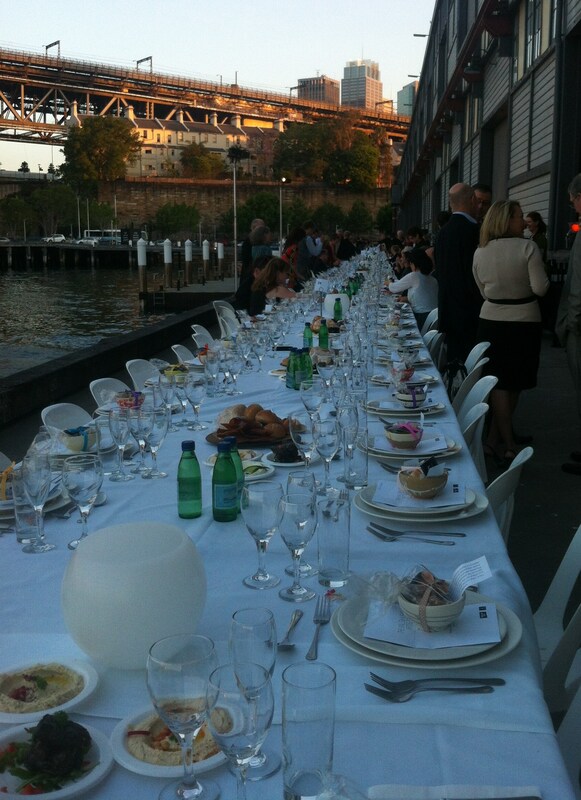 The dinner was held on a single long table that pretty much ran along the length of Pier 2 at Sydney’s Walsh Bay. Spectacular views of the bridge last all night. 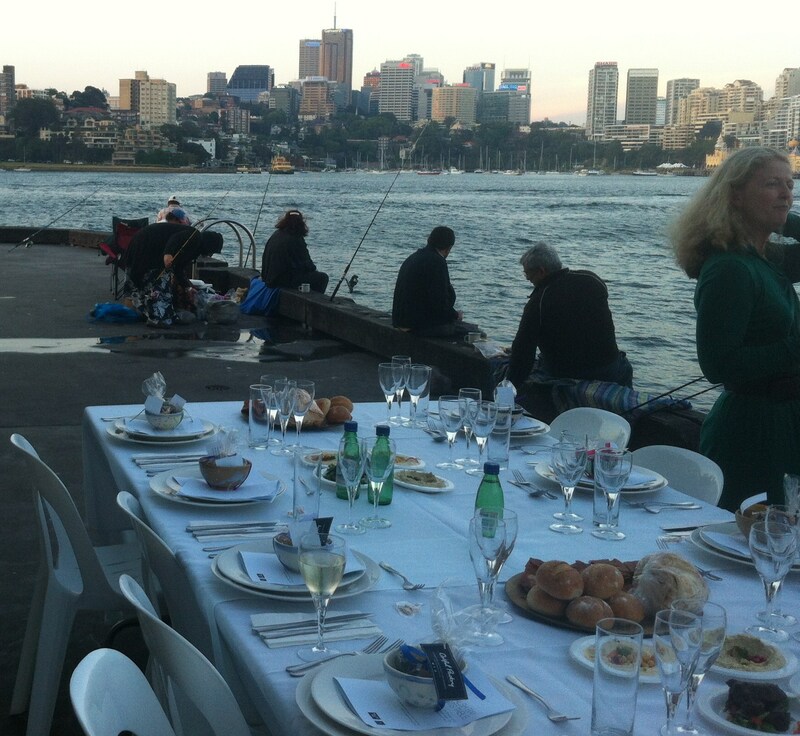 I loved the fact that the fishermen weren’t squeezed completely off the wharf. I also slipped in a quick visit to Baxters Inn in between the end of work and the start of the dinner – but that’s a story for another day.